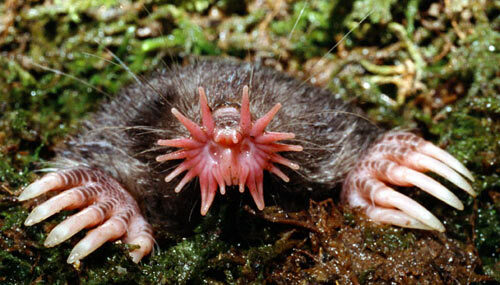 The Star-nosed Mole is truely a weird looking creature. From his weird looking nose with the finger-like tentacles coming from them to the HUGE claws on his hands I think you’ll admit he is one of the weirdest creatures there is. A face only a mother could love. Fact. That weird looking thing is to help him feel his way around, after all those claws aren’t going to be much use for that. They have no less than 25,000 minuscule sensory receptors on it known as Eimer’s organs. These are important as the mole, along with most burrowing moles, is actually blind. You may think this hampers his feeding and predatory skills but you would be wrong as this little mole holds the record for fastest-eating mammal. The time it takes for those sticky fingers to feel something and figure out if it is edible is as short as 120 milliseconds. The brain takes 8 ms to decide. Though he probably hasn’t been given fast food before. That may stump him. And all this is packed into a tiny nose that is only 1cm across. The mole lives in wet lowland areas and dines on worms, mollusks, aquatic insects and small invertebrates. It often likes to take a swim and can actually feed from the bottom of streams and ponds. Not barrels though. Like the good ol’ European mole it burrows and digs tunnels for foraging. Adults are about 15-20cm in length, have a thick black water-repellant fur, weigh about 55g and like to play hide and seek. Ok maybe not the last one.